Our first full day was spent exploring the city centre. Cairns seemed to be a mix of everything. Old heritage buildings sit next to tattoo parlours and backpacker hostels, rounding a corner you might find an Asian style night market or a strip of expensive restaurants packed with tourists. One of our favourite areas was the Esplanade on the seafront. It was a modern looking recluse for families and tourists, with a large swimming pool and variety of fitness stations running along the beach (including beach volleyball and outdoor gyms!). There was even a timetable for free fitness classes held there such as Aqua or Yoga which we thought was an amazing idea. 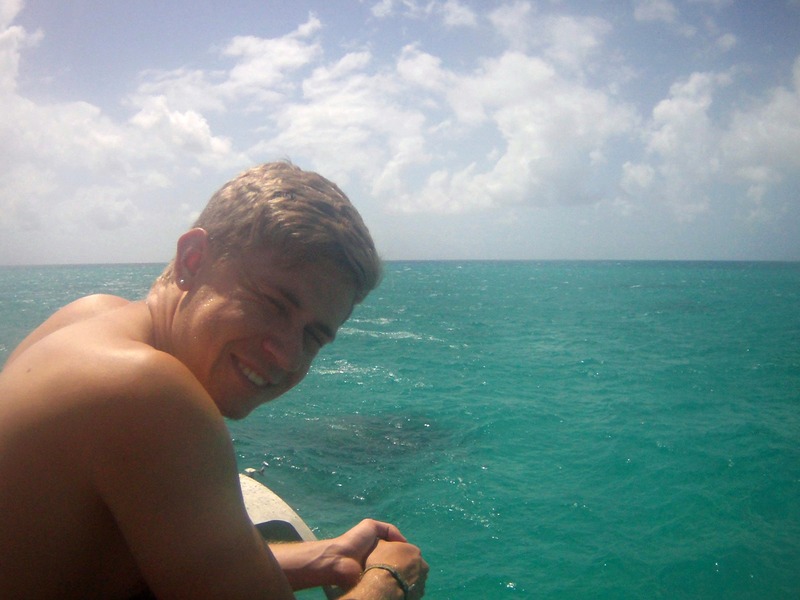 The next day we headed off on our dive trip to the The Great Barrier Reef. The reef stretches across much of Queensland’s coast and there are many places to dive or snorkel it, but Cairns is one of the most popular. There are a number of different boat trips that go from the harbour everyday. The one we chose was called Ocean Freedom. It was brilliant. From the second we stepped on board the crew made us feel very welcome. 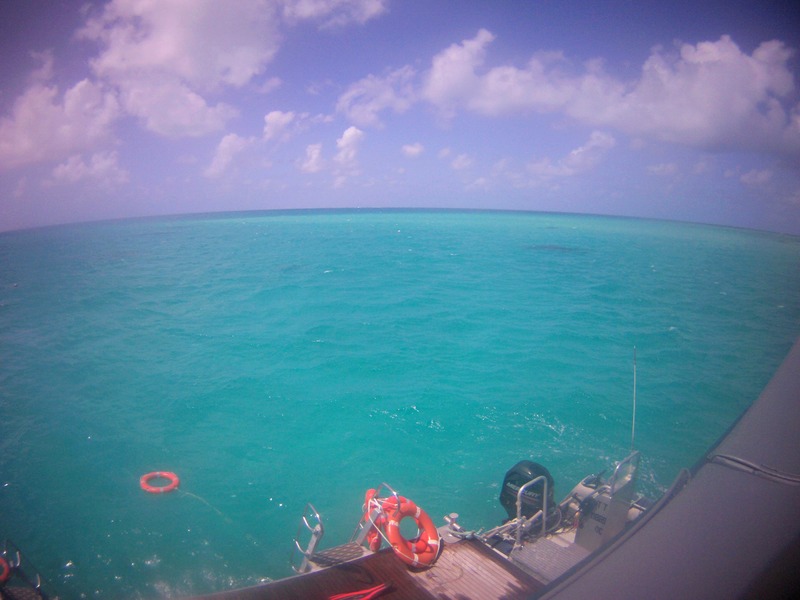 They went through all the safety points, reassured any nervous first-time divers/snorkelers and explained about the day. 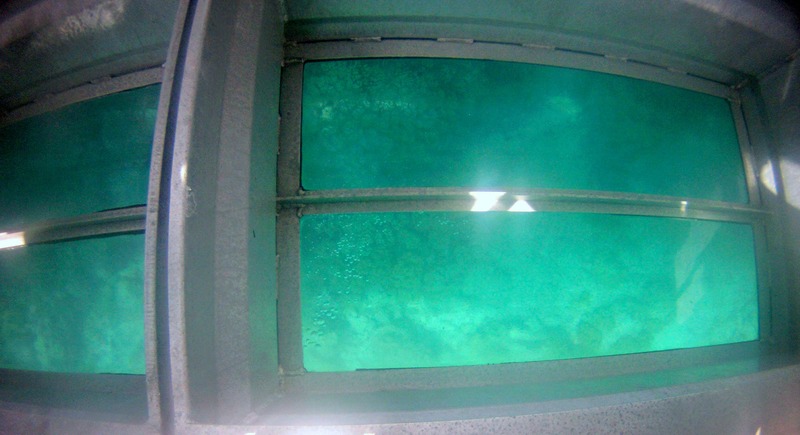 The boat was clean and spacious with 3 levels. The top two decks were kitted out with seats for soaking up some rays or gazing out into the sparkling blue horizon. The bottom deck had the prep area with all the diving equipment and the dining area where we had an AMAZING lunch of fresh salads/fish/pastas/meats/cheeses. The guy driving the boat was very informative as myself and Mark fired a million questions at him about the reef and the wildlife and what the biggest shark was he had ever seen (Tiger Shark a couple of weeks back, massive). During the snorkelling we saw some amazing coral, some massive fish, a stingray and a big 2 metre reef shark sleeping under some rocks! Armed with the underwater Muvi camera (go-pro like thing), we took it in turns getting some cool videos of the experience! On the swim back to the boat I had completely forgotten about the crew telling us that a ‘friendly’ barracuda fish liked to chill at the back of the boat whenever they stopped in the area. Let me tell you, barracuda, they do not look friendly! They are about a metre long, with sharp teeth and a mean look and when you are swimming casually along and suddenly come across one unexpectedly right in front of your face it is a slightly jumpy experience…. 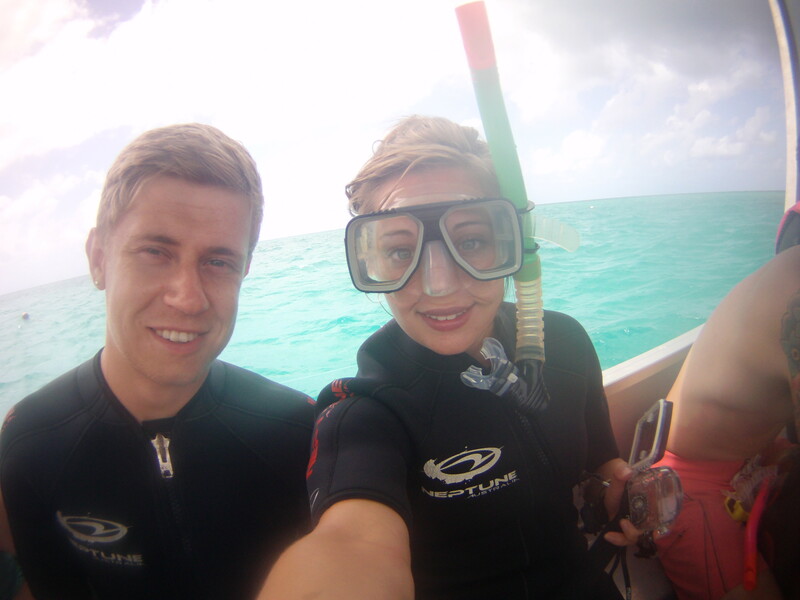 The dive that we did was for first time divers as Mark had never done it before and I hadn’t done it in ages. This meant going down with an instructor who adjusted your buoyancy accordingly, made sure that you knew all the signals, that the pressure was ok, your ears were ok and you were generally happy. I went down with Mark and each of us took one of the instructors arms and were guided along an unforgettable tour of the reef, with him pointing out different things. We saw another reef shark (smaller this time) chilling on the sea floor which scuttled away when we came near and all sorts of coral. We swam through schools of silver, glistening fish and saw Nemo (clown fish) poking his head out of his little coral anemone home just like in the film! It was like a dream: the beams of light cascading through the aqua waters, the quiet peacefulness of the calm ocean, the colourful fish letting us swim amongst them and experience their underwater world. It was something I had wanted to do for an eternity and I don’t think I could stop grinning throughout the whole experience. Our watery experiences done with for the day, we slept well that night and the next day (campervan dropping off day!) 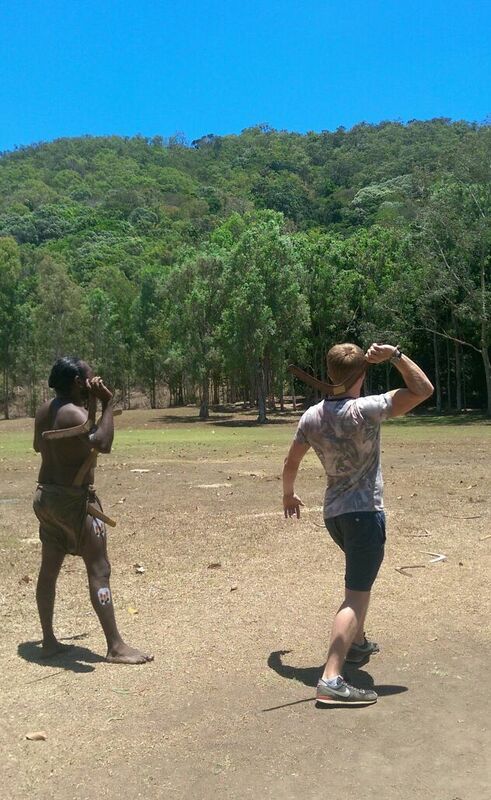 we went off to explore some of the Aboriginal culture that is very prominent in Cairns. This meant taking our camper on a final little spin to the edge of the city where the Tjapukai Aboriginal Cultural Park sits. We found this a great centre, with lots of interaction and informative displays from native Aboriginal people. They even taught the audience a song so that you could join in and pulled some people up on stage to learn some dances. 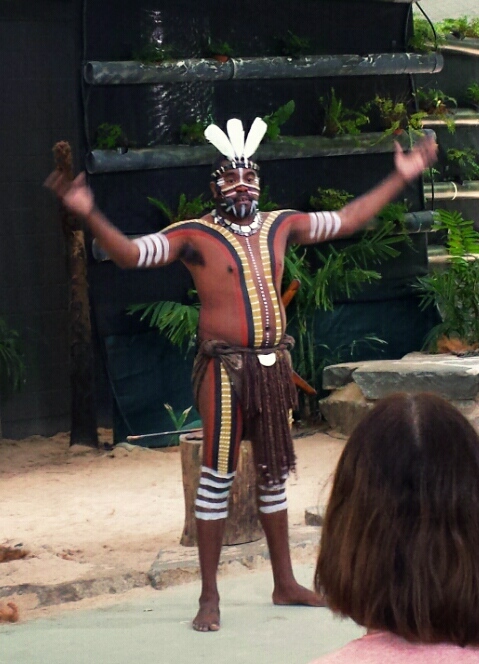 We finished off the day having a bit of aboriginal body paint put on and headed off to wave farewell to our campervan. At the drop-off point it was a sad moment leaving our spaceship companion behind, it had been an amazing 4 weeks. The freedom the campervan gave us to explore made the East coast trip even better than we could have imagined. We had our ups and downs, got lost…. 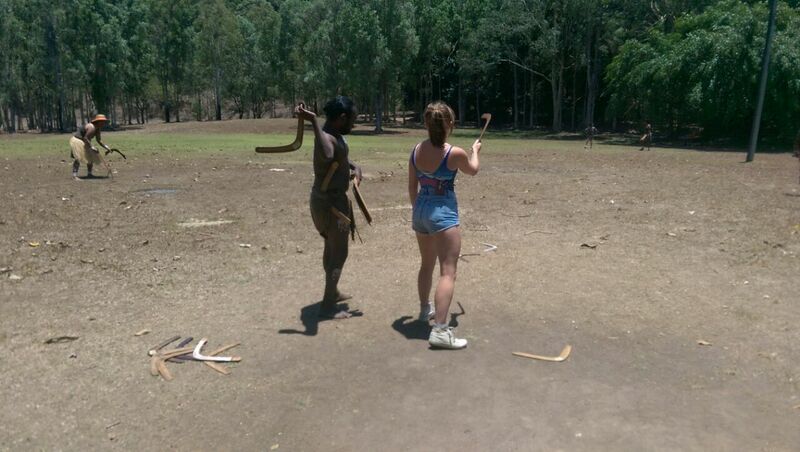 and lost again, had some close calls with some kangaroos and some mind numbing drives across endless roads. We pushed it to its extreme climbing up mountain sides, drove through lush forest and alongside glistening coasts, saw sunsets cast the horizons in gold and had such a laugh along the way. We wouldn’t have changed a thing. Our last night before flying down to Sydney was spent in an air-conditioned double room at Calypso Hostel…. we slept very very well that night.